It's a great feeling to be called to do something. Many students I know in seminary are powered by that insatiable thirst for deeper Bible knowledge and insights. They spend hours in research. They writes tonnes of papers ranging from Church history to Christian theology, from Christian spirituality to practical faith, from biographies of great Christian leaders to ministry skills development such as preaching, teaching, presenting, and sharing of testimonies. They go deep into the different areas of theological studies, and go wide when it comes to learning how best to present the gospel in an increasingly pluralistic world. Having mingled with many students from North America and beyond, I can say that many begin their theological studies with a clear sense of purpose and mission. A friend of mine once interacted with me about my own sense of calling. He first asks what I am called to do. I said I wanted to be trained and then return to the marketplace, and to live out my faith wherever God has called me to work in. He then continued with the question: "How sure are you?" I replied with a pretty strong sense of conviction. That is history. Here lies the problem. We have become too caught up in the search for the "specific call" of our lives, that we downplay the "general call" God has given us. Many of us know the general call but chooses not to emphasize them. 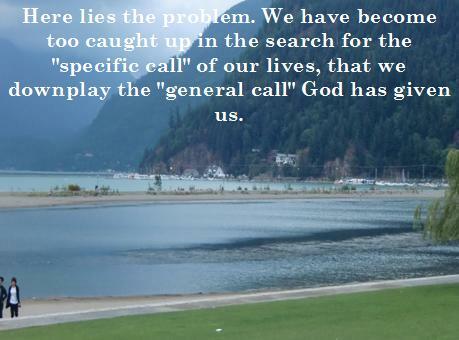 Many of us do not know the specific call, and chooses to fret our lives over it. Are we lost because we focus too much on the unknown, that we forget about the known? What kind of person are you calling me to be? How best can I bless the community I am presently in? Who are the people that you have placed in my heart? What are the gifts and strengths I have? What are the present needs? When is the best timing? These questions and many more form the pieces of a big jigsaw puzzle of life. Calling is much bigger in terms of vocational choices, whether in the laity or as a clergy, whether in the secular marketplace, or the spiritual houses of worship. Calling is more than a seven-letter word to analyze and to study. It is a single word focused on asking this basic question: "How is God glorified in this calling of mine, in a community of God, for a clear purpose for God?" If we concentrate too much on our specific call for God, we get sucked into a "God-and-I" mentality that puts the self above the community. POINT: Calling is bigger than a God-and-I against the world relationship. It involves a community. Like a movie scene where lovers run past each other on a beach, churches and seminaries seem to miss each other in matching graduates to jobs. This sentiment is an indictment on churches that have been supporting seminaries for ministry needs. It is also an embarrassment for theological institutions that have not kept up with the needs of the modern church. It frustrates graduates who have entered expensive theological education with high hopes, only to see that reality has to do with the lower octaves of ordinariness instead of high pitches of ministry. If we go on a witch-hunt mode, I guess all parties will have to shoulder some responsibility. If only they have talked and interacted regularly. I suppose there is one good thing to learn from it all. We need to be constantly listening to one another, and to God. We need a humble heart to learn from one another. If we get so caught up in the "specific call" of our lives, we will tend to hear God from human perspectives rather than God's perspective. In fact, our obedience to the general call of God, is a fair indication of our readiness to obey the specific call when it comes. POINT: Hearing God's Call Needs Humble Ears and Willing Hearts. There are many biblical examples of how people are called in the Old Testament. Abraham was called to leave Ur to go to a place that the LORD will show him (Gen 12:1). Hosea was called to marry a prostitute. Isaiah was called when he responded to God's holiness (Isaiah 6). In all of these examples, at least three things need to happen. First, there is a call. Second, there is a hearing. Third, there is an obedience. Abraham is called straightaway in Genesis 12:1 to leave his country. Often heralded as a man of faith, the significance in Abraham's response is in his response to God in faith. God had not shown him exactly where to go. God leaves his promise very much in the future tense. "Go to the land I will show you." In contrast, some of us want to know for sure where or what we do, before we take the plunge. Not Abraham. God speaks. Abraham hears. Abraham obeys. Is there anything more complicated than this? Alas! Our modern world of choices have complicated our sense of calling. We ask all kinds of questions. We agonize over which parish to choose. We crack our minds to distill what is God's call amid the mass of information and choices. Our sense of calling gets mixed up by the many questions, where firm answers are few. Perhaps, the reason why many people are unable to discern their calling is that they ask all kinds of questions from a lack of focus. After all, a double-minded person will not get a single answer. He gets all kinds of possible answers. It takes a laser-sharp question to unleash a single-minded focus on God's call. It boils down to the question of discipleship. How deep our desire to hear and to obey God's call, is embedded in how deep is our readiness to follow Christ all the way. Beyond the quest for certainty, we must deal with the question of how much we desire Christ in the first place. That is our general call. POINT: Our call is to Christ. Period. When we read about the certainty of these biblical patriarchs and prophets, sometimes, we wish that we can be as sure as them, that we can be absolutely certain that God has called me to do this or to do that. Such a desire is common. Once I asked a group of Christians about how many will obey, if they are sure God has called them. Many hands went up. For many people, it is not a question of whether we are willing to obey or not. It is a question of understanding calling altogether. What is a calling? How do I know I am called? Often times, this question is not something to be discerned alone. It is a communal activity. Here is my belief. We need to adopt the attitude of Abraham who was called to leave, and to believe that God will show him where to go. What is needed is the readiness to obey. Most people believe that God's calling is in the Bible. If that is the case, what is needed more is that readiness to obey. Unfortunately, many people are mining the Bible for more Bible knowledge and spiritual information, instead of living out biblical wisdom and cultivating spiritual formation. Begin with what we do know, and trust God to show us the way ahead of us. Like the young Samuel, he does not know that the voice he has heard is a call from God. He needed someone like Eli to guide and to show him the way. Instead of giving the young Samuel loads of advice, Eli simply asks Samuel to be ready for the next time he hears the same voice. "Speak LORD, for your servant hears." (1 Samuel 3:10) Samuel is sure about the call, but not sure about the rest. All he needs to do is to listen. Abraham is not sure about the destination, but he is sure about the call of God to leave. He obeys. Isaiah is sure about the vision of God's holiness. What he is not sure is the exact details of God's call, what to do and where to go. His willing heart to obey matches the call of God. This is what we need. We cannot be trapped in an endless circle of seeking God's call in passivity. We need what I call an active waiting. Active waiting is in obeying the general call of God, and wait for the specific call to show up. Active waiting is in applying the first two stages together. Concentrating our efforts on the first question can dangerously tempt us toward questioning God irreverently. It shifts the blame toward God. It frees us from any responsibility to do anything in the first place. Moving to the second question is probably the more important question. Perhaps, when we are lost about our own sense of calling, we need to honestly ask ourselves about question #2. From my reading of Paul's introduction to the Romans, Paul is certain that he is called to be a disciple of Christ. He begins with what he already knows. We too can do the same. Read in this light, our calling is not very different from Paul's initial calling. It is in his obedience to this initial calling that has made all the difference. Is that not the same as the rest of us who call ourselves followers of Jesus? Set apart for the gospel of Christ. Is that not similar to our own sense of calling? One helpful way to understand calling is in terms of a general or specific call. The general call is for us to honour God, to lift Jesus higher everywhere we go, and to obey the prompting of the Spirit in all circumstances. We are called to follow Jesus all the way. We are called to be the holy people of God. Unfortunately, many people are stuck with the second question. This has led to the unfortunate case of one forgetting the general call in the quest for the specific call. More often than not, the specific call is clarified as we all pursue the general call well. Here is what I suggest. As long as we are focused on obeying Christ, whether it is a general or specific call, whether it is managing a huge organization, or making coffee as a servant, whether it is a high profile role, or a lowly unseen role, our goal is in glorifying Christ. When this happens, something special happens inside us. "Where am I called to serve?" BECOMES "Lord, help me be faithful where I am now, and be ready to serve you in another place when you call." "What role am I called to serve in?" BECOMES "Lord, help me not to be distracted by what role I play, but to serve in that role with all my heart." "Who am I called to be?" BECOMES "Lord, help me be pure and holy in your sight, to be God-pleasers more than man-pleasers." Many of us are not as Christ-focused as we need to be. As we get caught up more and more with the quest for our specific call, we unwittingly lose our grip on our general call more and more. Focus on the clear parts of Scripture, and trust God to show us the rest in due time. When the time comes for God to reveal his specific call for us, our practice in the general call will have prepared us in heart, in mind, and in spirit. When that happens, hearing God's call is a no-brainer.